Slots.lv is a vibrant online casino catering specifically to the American and Canadian market. It offers a full range of instant-play casino games including slots, table games and video poker from software providers like Real Time Gaming, Rival Gaming and Bodog Custom. There’s plenty of welcome bonuses, ongoing promotions and rewards available for registered players, with access available via desktop and mobile. Casual players? – with games available for free play and with real money deposits starting as low as $20, recreational players will find plenty of entertainment here without too much risk on the wallet. Table game fans? – with close to 20 table games available, the variety is pretty good but roulette and blackjack fans may be disappointed with the lack of variants compared to some other online casinos. High rollers? – high rollers will need to either gain VIP status or start using Bitcoin to lay down the large wagers, with standard deposits capped at $1,000 until VIP status is granted. Welcome Bonus – up to $5000 in matched deposit bonuses available, spread out over your first nine real money deposits. Enter the code HELLOSLOTS200 when making your first deposit to receive a 200% matched bonus up to $1,000, then enter code HELLOSLOTS100 to receive a 100% matched bonus up to $500 over your next eight deposits. Bitcoin Welcome Bonus – up to $7500 in matched deposit bonuses available when depositing using Bitcoin, spread out over your first nine real money deposits. Enter code SLBITCOIN300 when making your first Bitcoin deposit to receive a 300% match up to $1,500, followed by code SLBITCOIN150 to get a 150% match up to $750 per deposit for your next eight deposits. Refer a Friend Bonus – receive up to $200 in casino credits for every friend you successfully recommend to sign up for an account with Slots.lv. Depending on your loyalty status, you may be eligible for additional bonuses as part of the Refer-a-Friend program. MySlots Rewards – this is the Slots.lv loyalty program, where you earn reward points for every deposit you make and play through at the casino. There are eight different loyalty tiers, starting at Depositor Rewards level and going all the way to VIP Exclusive Rewards, with different bonuses and features available to players at all tiers. Slots.lv also offers one off promotions like weekly bonuses, social media freebies and mobile promos, so bookmark the site to check the promos regularly, and make sure to sign up to receive promotional emails to stay in the loop. 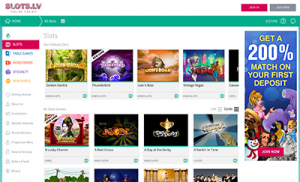 Slots.lv is a browser based casino, so all games are available for instant-play with no downloads required. If you have trouble accessing this site, try clearing your cache and reloading the page. The layout of Slots.lv is pretty straight forward. The most popular game titles are listed in icon form on the homepage, while you’ll find the game categories and main information hubs listed down the left hand side of the page. Games can be played for practice play or for real money bets, just hover over the game you’re interested in to learn more about the rules of the game or start playing for free or real cash. Mobile app/optimised site: Although Slots.lv doesn’t have its own native app, mobile users can easily access the instant-play mobile site directly using the web browser of your smartphone or tablet. 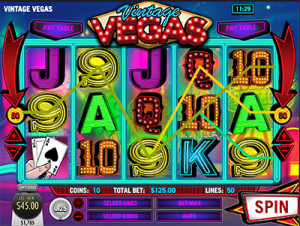 There’s a decent selection of mobile optimised games available, including table games, video poker, and specialty games, but the major drawcard is the slots, of which there is a large mobile collection. New games are added to the mobile casino regularly, and are available for Android, iOS and Windows Phone. Slots – Golden Gorilla, Thunderbird, Lions Road, Vintage Vegas, Caesar’s Empire, Aztec’s Treasure, Ares, A Day at the Derby, Bulletproof Babes, Catsino, Cirque de Slots, Crystal Waters, Desert Kingdom, Demi Gods, Diamond Dozen, Dragon Princess. Video Poker – Double Jackpot Poker, Jacks or Better, Bonus Deuces Wild, Bonus Poker Deluxe, Double Double Bonus Poker, Joker Poker, Loose Deuces. Table Games – Blackjack (including Double Deck Blackjack, European Blackjack, Zappit Blackjack and Single Deck Blackjack), European Roulette, American Roulette, Perfect Pairs, Pai Gow Poker, Baccarat, Red Dog, Caribbean Hold’em, Caribbean Stud Poker, Craps, Let ‘Em Ride. Specialty Games – 30 Ball Bingo, 80 Ball Bingo, American Bingo, Beach Bums, Sudoko Number Box Games, Keno, Itchin’ to Win, Cast for Cash. Withdrawal options are a bit more varied, with withdrawals available using credit card, Bitcoin, bank wire, rapid transfer and check via courier. Players can only make one withdrawal per payment method every seven days, and will be required to complete a credit card verification or a bank account verification before withdrawing funds. Slots.lv is licensed by the Kahnawake Gaming Commission which is located in the Mohawk Territory of Kahnawake, Canada, which has a good reputation as a leading online gambling jurisdiction. All games at Slots.lv are audited by a reputable, unbiased third party, iTech Labs, to ensure all games are operating using legitimate RNG (random number generated) software. Slots.lv fully supports responsible gambling practices and offers a range of customizable options for players to stay in control of their online play. There’s no live chat option – the only customer help available is via contact form or phoning 1-855-446-3770, although there is a semi-decent FAQ section. While the game selection is solid, we would have liked to see some games from the big names like Net Entertainment or Microgaming to enhance the blackjack and roulette selections, or increase the winning potential in progressive jackpot games. There’s no live dealer casino games, which is a big letdown. The lack of deposit options like Neteller, Skrill and Paysafecard will be a deterrent for many, especially for those who like to keep their online gambling completely anonymous. We love Bitcoin is accepted as a payment method, as Bitcoin is increasing in demand lately and will please many players. The extensive rewards program offers lots of different player benefits and provides an incentive to stay loyal to the site. Mobile-optimised titles are added to the portable site regularly, including all the hottest Slots.lv slot titles. If you’ve got the money available to make multiple deposits, the welcome bonus is one of the biggest we’ve seen from a trustworthy online casino. Specialty games like bingo, keno and Sudoku add a nice touch if you want to try something a little different. Give Slots.lv a try today and claim up to $1,000 in bonus money when making your first real money deposit using USD or CAD.